The story of the Opuha Dam is a story of South Canterbury, and now it is told in a book. Drought is the curse of the land and it came to South Canterbury in the 1980’s and did not leave. It sucked the life out of the land and eroded the spirit of those farming it, and, in a strange way, it created a revolution. South Canterbury, then, had little in the way of irrigation – and there are constant cries still for more water – but the terror of the nor’west winds of 1982, 1985 and 1988 focused as never before the minds of those whose job it was to tend stock and raise crops. Tom Henderson was one of those men. He is retired now, and living in Pleasant Point, but he could see then the need for water storage. It was, he says, the only way to get around drought. He believed then, as now, that if the region was to have a prosperous future, it had to come from the land. Henderson was instrumental in forming the Opihi River Augmentation Society, a wordy title for a group that became the driving force that led to the creation of the Opuha Dam near Fairlie. Much has been written about that dam; about its creation – its devastating collapse – and its rebuilding. 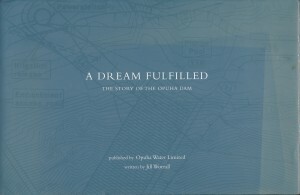 Timaru author Jill Worrall has wrote a book on the dam – A Dream Fulfilled, The Story Of The Opuha Dam – for Opuha Water. Worrall’s book is more than a set of facts and photos; it is about the tenacity of South Cantabrians; about guts and drive and an unswerving will to succeed. It is also, in no short measure, about politics, pressure, disappointment, elation and drought. Now, the dam, and its associated irrigation scheme, are held up – and rightly so – as what can be achieved when water can be stored. In South Canterbury’s case, it is much. The dam, giving surety of water supply to farms, has led to the creation of 500 new jobs; augmented the Opihi River to the point where once again it is an anglers’ delight; created a very popular recreational lake near Fairlie, and, not least, generates electricity. And it was all done by private enterprise at a time when the Government was the only body building dams or creating anything like a major project. Tom Henderson is delighted with the project – and he has every right. He reckons having local people on the project was a major reason for its success. Now, the scheme is owned by its farmer shareholders, giving Henderson real confidence in its future for the benefit of the whole community. But to know its success is also to know of the dam’s big failure. Few will have forgotten the news of February 6, 1997. It was calm in Timaru, but near Fairlie, a lake began to form behind the dam, fed by three days of steady rain. It rose and rose and, eventually, led to the breaching of the dam, sending a thundering wall of water towards the Skipton Bridge, punching it out, and then into the Opuha and Opihi river systems. More than 200 people were evacuated and, almost unbelievably, no one was killed as the water surged to the sea. More than 1000 animals, though, lost their lives. The breach caused $8m worth of damage to the dam, and downstream farms suffered losses of around $4m. South Canterbury, for all the wrong reasons, was in the national news. The devastation was huge; the dam gutted and rent apart. It was fixed, at no small cost, to be the success it is today, a decade on. But that breach led to prosecutions by the regional council, ECan, something that still rankles in South Canterbury – and something not forgotten today as various councils in Mid and South Canterbury talk loudly about the likelihood of backing the formation of a central South Island regional council. After its breach it took nine months to put the dam back to the state it was before its collapse. On a sunny day on November 7, 1998, the dam was opened. It was a red-letter day for South Canterbury. The late Sir Peter Elworthy arrived in his yellow Tiger Moth and, thudding in from the coast, came a World War 2 fighter. It was stirring stuff; a dream turned reality. Worrall’s book has captured it all. The dam story is one of grit and courage, of the triumph of individuals. It is, frankly, a good dam read. Copies of the book, ‘A Dream Fulfilled, The Story of the Opuha Dam’ are available for purchase for $30.00 each from the Opuha office or by emailing office@opuha.co.nz.